Whether it’s because your kids have left for college or you’re preparing for retirement, many homeowners choose to downsize at some point in their lives. Making the move from a large home to a smaller one can be both liberating and challenging. If you’re getting ready to downsize, here’s what you should know to make the process as easy as possible. If you’re having trouble coming to terms with the idea of having a smaller footprint, it can be beneficial to remind yourself of why you’re downsizing in the first place. Do you have a room or rooms in your current home you never use? Are you looking for a way to lower your monthly expenditures? Do you want to live in a home where outside maintenance is taken care of for you? 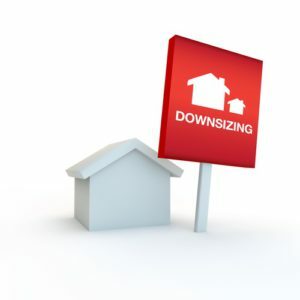 Downsizing can provide solutions to all these issues and allow you to make choices that fit the lifestyle you have now, not the one you had when you first moved in. OK, so you’ve decided it’s time to downsize. Now what? The first step you should take is to decide what you’re looking for in a new place. How many bedrooms do you really need? Would you like a home with no stairs? Are you hoping to be within walking distance of amenities, like shopping, the gym or restaurants? Take time to determine exactly what your needs are before you begin your search. Once you’ve zeroed in on your new home, measure each room and note how much storage is available. Be honest about how much space you actually have. There’s no sense in downsizing if you plan to keep all your possessions, so you’ll want to be clear on how much you’ll need to let go of so that you have enough room in your new space. Here comes the hard part – deciding what to keep and what to get rid of. A good way to tackle this issue is to think about what you’d want to replace if you were to lose everything. Do you have exercise equipment gathering dust? Are you holding on to your kid’s items that they’ll never retrieve? Consider letting go of any items you haven’t used in the last year. If you’re in doubt, rent a storage unit for six months and store the items you’re uncertain about. Whatever items remain after that time elapses, you can let go of. Once you’ve eliminated the items you don’t intend to take with you to the new house, you can sell or donate them. There are several ways to sell your belongings, from hosting a garage sale to posting items online on sites like Craigslist, Facebook Marketplace or eBay. For items you can’t or don’t want to sell, you can donate them to friends and family, or give them to charities such as Goodwill or the Salvation Army. Many organizations will even pick up your items for you if you arrange it with them in advance. As you move into your new home, take time to organize as you go. That way, once you’re moved in, you can spend time on all those activities you only dreamed about when you lived in a larger home. Although downsizing can be challenging, when you approach it with a healthy attitude it can be a truly exciting experience. Follow the guidelines above to make sure your move into a smaller space is just another turn in the road on the adventure of your life.